David Livshiz was an IILJ Scholar from 2002-2006. 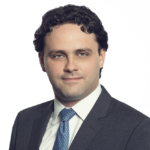 After graduating from NYU Law, David Livshiz worked as the Adviser on Counter Terrorism for the Permanent Mission of Palau to the UN, and as an associate at Cleary Gottlieb Steen & Hamilton. He is currently a senior associate at Freshfields Bruckhaus Deringer where he represents clients in complex commercial disputes, criminal and civil fraud actions, and bankruptcy litigation. He also works with companies and individuals in criminal and civil investigations conducted by the US Department of Justice, the Attorneys’ Office, the Securities and Exchange Commission and various other regulatory agencies. David assists clients in a broad array of contexts, including jury trials, proceedings pending before federal and state trial and appellate courts, and as debtors and creditors in bankruptcy proceedings (including in adversary proceedings and contested matters). He has worked in all stages of litigation, from initial investigations to trial. Additionally, David has significant experience representing financial institutions and corporations from countries of the former Soviet Union, as well as US companies engaged in business in the region, on their litigation and regulatory exposure in the United States.